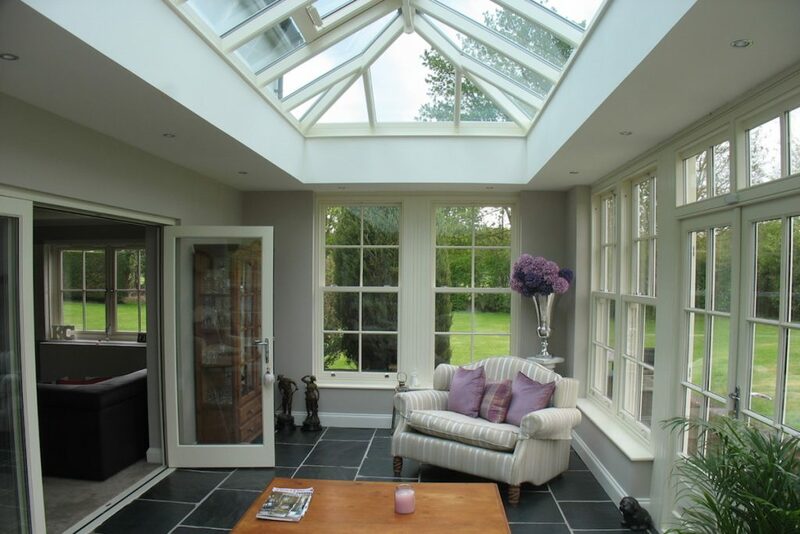 Stunning Transformation With Rickling Green Orangery. This Rickling Green property was in need of a bit of a facelift. Although generally in excellent condition, the windows and doors were old style single glazed units which proved to be draughty, cold and expensive! So when the owners wanted to update their property they visited the Cambridge Conservatory Centre at the Scotsdale Garden Centre for advice. Replacing the existing glazed units was an obvious must, but they also wanted a space to sit that would connect them to the garden. The existing doors to the outside were set into a high blank wall which offered no protection from the weather. And with such a wonderfully large garden, the owners really wanted to have a place to enjoy it from. As you can see from the photo below the area was only useable on a few days of the year when it wasn’t too hot, wet or cold. 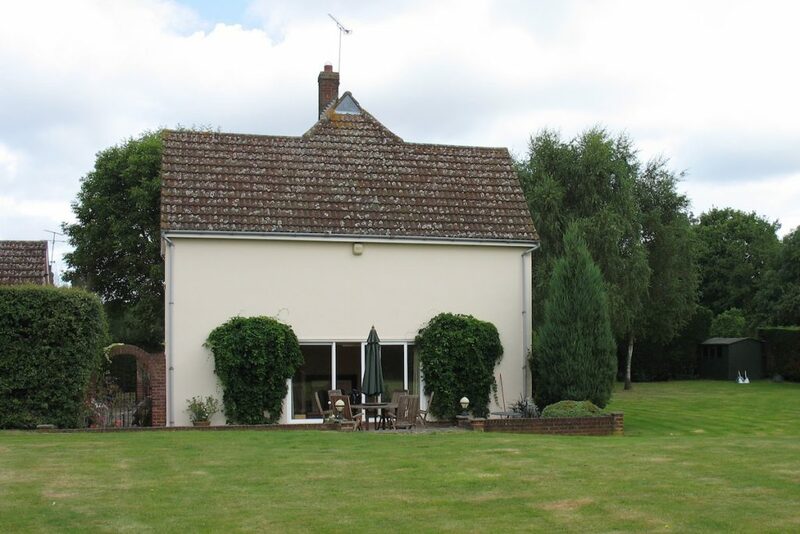 The home had a number of brick features and the owners were keen to have their new extension contrast with the cream render of the main house. After exploring the various options, we designed a 7.4m x 3.8m orangery that would sit almost the entire the width of the side of the house. Although the house was of an older style, the existing windows were very plain and did nothing to highlight the traditional styling of the home. The owners wanted to bring back more of the traditional elements and chose Hardwood windows with four panes of glass in each to create a criss-cross effect. With up to the minute double glazing, the new windows completely transformed not only the way the house looks, but also how it performs energy wise. 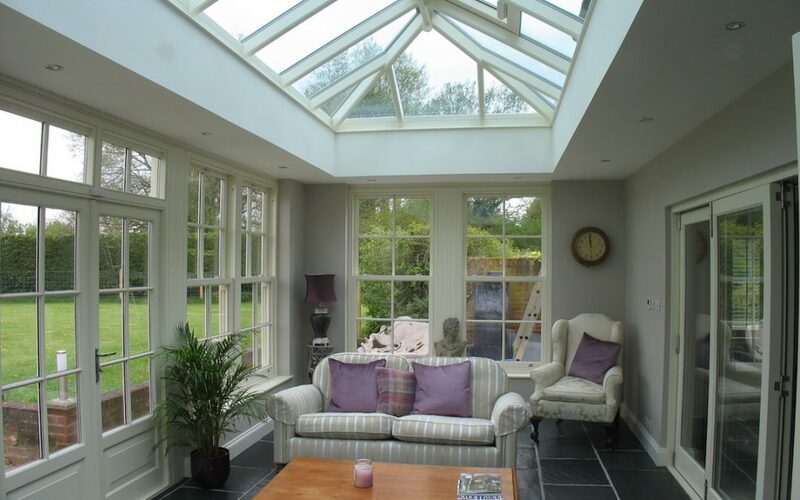 Equipped with a clear brief to create a traditional orangery we designed side by side sliding sash windows with vertical and horizontal glazing bars to immediately give a classic look and to mirror the new windows in other parts of the house. Wide French Doors with glazing bars that matched perfectly with the sash windows allow the owners to step seamlessly onto a small patio where a wrought iron table and chairs await them. And to each side of this gorgeous Rickling Green Orangery, two identical sets of side by side sliding sash windows push the walls back and invite the garden in. 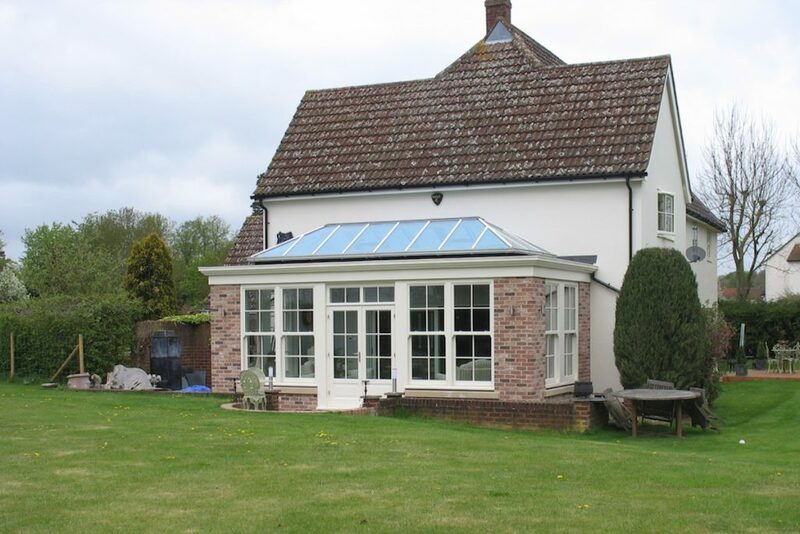 The roof lines on the main house are a combination of hip and gable end and the simple hipped design of the orangery lantern roof works perfectly alongside the simplicity of the home. Although this Rickling Green Orangery looks amazing from the outside, it’s on the inside that the full effect is felt. The detailing on the hardwood window mullions becomes apparent when viewed from inside. Vertical fluting continues the traditional feel the owners wanted and the deep sills allow special pieces to be displayed to perfection. The catches on the windows and the door handles are finished in shining stainless steel adding a sparkle of elegance that feels timeless. And the lantern really comes into it’s own as it soars away above your head accentuating the feeling of spaciousness. With new windows and doors throughout the house and a stunning orangery to boot, this home has been completely transformed from its ever so slightly tired previous appearance, into a sparkling traditional home that truly does justice to it’s fabulous location. Surrounded by windows and doors that frame the view beyond, I don’t know about you but I can’t think of anything better than to curl up in the comfy chair with a book on a rainy day. With thermally efficient temperature controlled glazing, I know that I will be snug as a bug in a rug in this Rickling Green Orangery no matter what weather is raging outside those stunning windows.